As North Korea mobilizes massive resources to “spruce up Samjiyon County,” nearby Hyesan City is also seeing active development. Although the city is being rapidly modernized thanks to “speed battles,” there are frequent accidents occurring at construction sites. 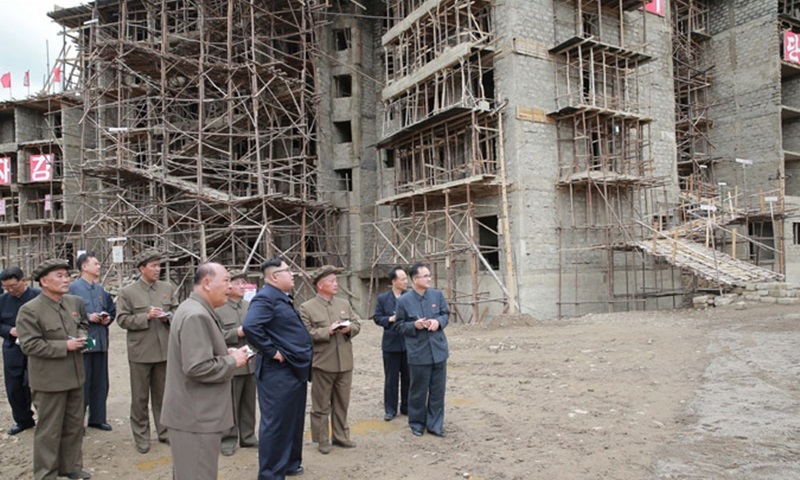 “A lot of apartments have been constructed near where statues of Kim Il Sung and Kim Jong Il were built in Hyemyung-dong (neighborhood) in Hyesan in 2015,” said a source based in Ryanggang Province on September 5. The source added that the development of Yonbong-dong (neighborhood) is almost complete. “Daycare centers and apartments have been built in Yonbong-dong and in Songhu-dong, which is near Wiyon-dong. An athletics center has been built to the happiness of students who can now exercise regardless of the weather,” he said. He also reported that the area around Yonhong Market, which is located between Wiyon-dong and Songbong-dong, has seen the construction of new houses over the past three years, and in Kumsan-ri, which is just outside of Hyesan City, the houses have been painted red. As apartment construction continues in Hyesan, a shortage of construction materials has arisen. According to a separate source in Ryanggang Province, materials are now being brought in from China. Real estate agents from other areas are flocking to the newly constructed apartments and rental prices are rising. As the construction boom has taken over the entire city, there has been a rise in construction site accidents. The “speed battles” employed to conduct hurried construction together with the lack of safety equipment has led to collisions, falls, and electrocutions. In mid-August, iron bars being moved by a large crane at an apartment construction site in Wiyon-dong collapsed, crushing two workers below, a separate source in Ryanggang Province reported. One of the victims was reportedly the Party Organization Secretary of Samjiyon County, and his death caused a major uproar in the area. “The Samjiyon County Party Organization Secretary was punished for issues relating to a Party project and sentenced to two years of “revolutionary training” from October 2016. Since then, he had been working as a laborer at the construction site. His “training” was due to be completed in just two months, after which he was scheduled to return to his original position,” the source explained. Last month, he continued, a 26-year-old member of a construction “shock brigade” died after being electrocuted on an exposed electricity wire as he was working on the walls of a newly constructed apartment. Although industrial accidents continue to occur at construction sites, the authorities are failing to implement effective safety measures. Most of the accidents can be at least partially blamed on the attitude of complacency displayed by the authorities in terms of safety regulations. “The construction project managers demand rapid progress, so the construction process is haphazard and accidents occur in places that workers don’t expect them to,” the second source said.